coloAZ Review 2019: Is coloAZ a Good Hosting? 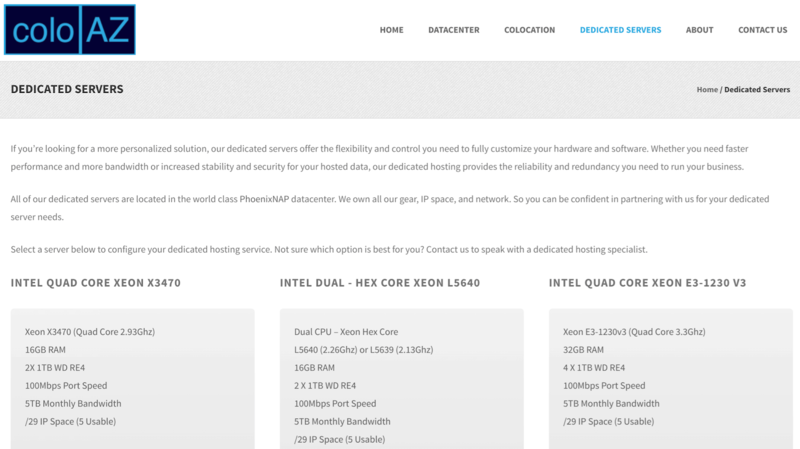 Small hosting company coloAZ provides hosting solutions from the state-of-the-art PhoenixNAP data center facility. This vendor also provides colocation services, dedicated servers, and data center services to individuals and small businesses in the United States. Small web hosting company coloAZ has headquarters in Phoenix, Arizona. They offer premium dedicated servers and colocation solutions to U.S. customers, and their core competency is to quickly set up and manage hosting at the state-of-the-art PhoenixNAP data center. For clients looking for more personalized solutions, coloAZ provides dedicated servers that allow you to fully customize the hardware and software. Whether you want more bandwidth, faster performance, or increased security and stability, coloAZ has a dedicated server solution to meet the needs of most SMEs. The dedicated server plans come with at least 16GB RAM, 120GB disk space, at least 5TB monthly bandwidth, and 100Mbps port speed upgradable to 1000Mbps. The main downside of coloAZ’s hosting solutions is the fact that they don’t include backup services, so customers have to perform their own manual backups to avoid losing website data in the event of a disaster. This vendor also doesn’t include such features as SSL certificates and one-click script installers, presumably because they don’t offer shared and VPS hosting solutions. The prices of coloAZ’s hosting plans are a mixed bag; their colocation services are reasonably priced but have a high set-up fee whereas their dedicated server solutions are simply expensive. 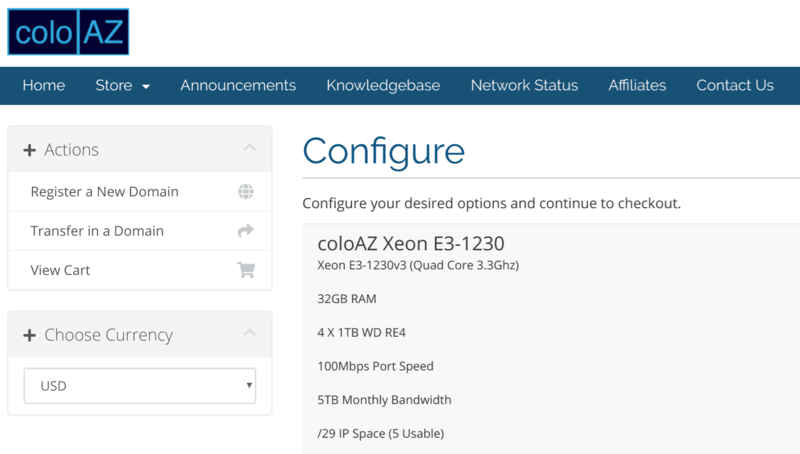 The coloAZ website only displays the price of the beginner colocation package, so any customers wanting to upgrade to a higher plan will have to contact the company for pricing. In any case, you can’t purchase any kind of colocation online, but you can configure and purchase dedicated servers online. While coloAZ boasts 100% uptime availability, they shy away from backing this claim with a compensation plan. They also offer no free trial and no money-back guarantee. Clients can contact coloAZ’s customer support team via email, telephone, or ticket, but not live chat. They do not state if their support is 24/7, and (unfortunately) all my attempts to contact the company were unsuccessful. Although their website includes links to additional resources, both the knowledge base and FAQ section appear to be blank. For colocation customers, coloAZ appears to have the facilities to host even very complex and resource-intensive websites. But as a reviewer, I’m disappointed by the lack of features and the apparent disorganization of their customer support department. So personally, I’d probably look for a company that’s a bit more mature. Wondering how coloAZ stacks up against other Web Hosting companies? Enter any other Web Hosting company and we will give you a side-by-side comparison.